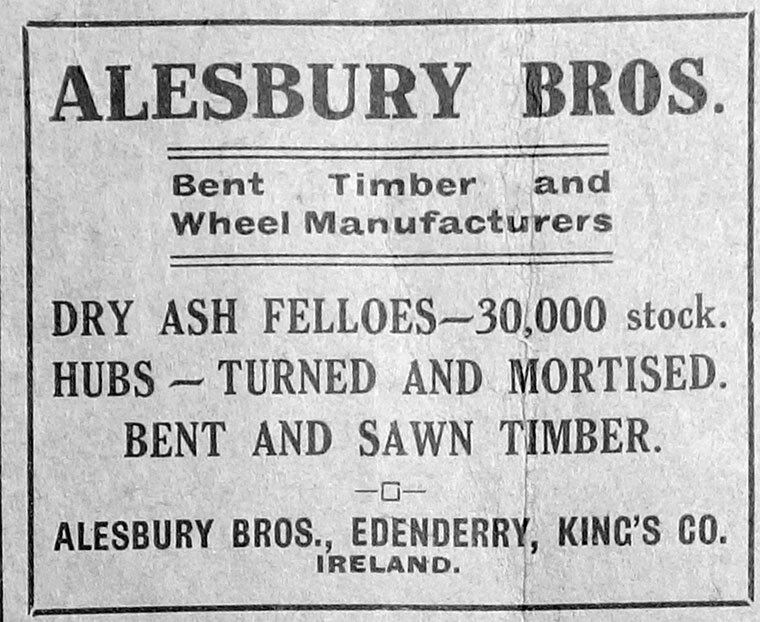 Alesbury Brothers of Edenderry, Ireland. The company built the first car manufactured in Ireland. At some point the factory was destroyed by fire. 1904 New premises set up near Grand Canal harbour, Edenderry, but this was also lost to another fire. 1907-1908 Built the 'Alesbury' powered by an 8/10hp two-cylinder Stevens-Duryea engine and had solid tires. It was one of the very few cars built in Ireland. Exhibited at the 1907 Dublin Motor Show, the four-seater car was constructed "entirely of Irish wood". 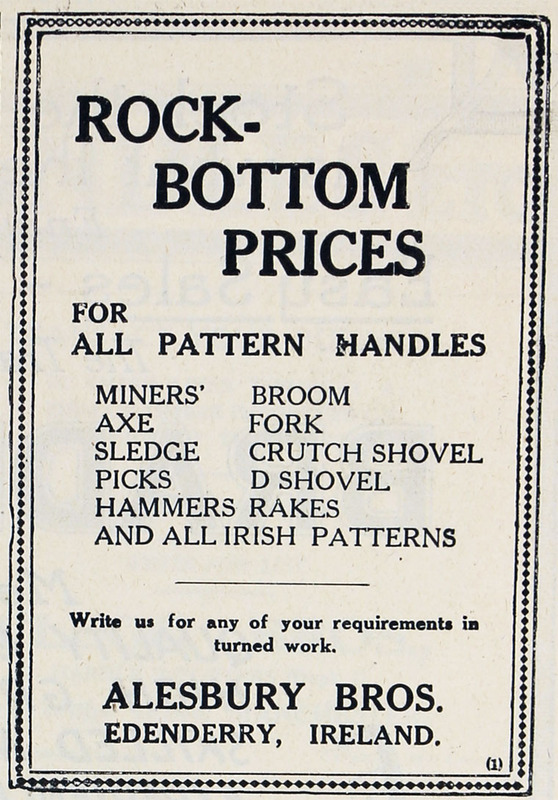 The Leinster Leader reported as follows: "Messrs. Alesbury Bros, are to be congratulated warmly upon the first product of their now motor-building enterprise. The first car turned out by these energetic manufacturers was exhibited at the Motor Show in Dublin during the week and received very flattering encomiums from experts and others for its appearance and excellence." The motor registration letters for Kings County (County Offaly since 1920) was IR. Daniel Alesbury had IR Numbers 8 & 9. Alesbury Brothers - 61. 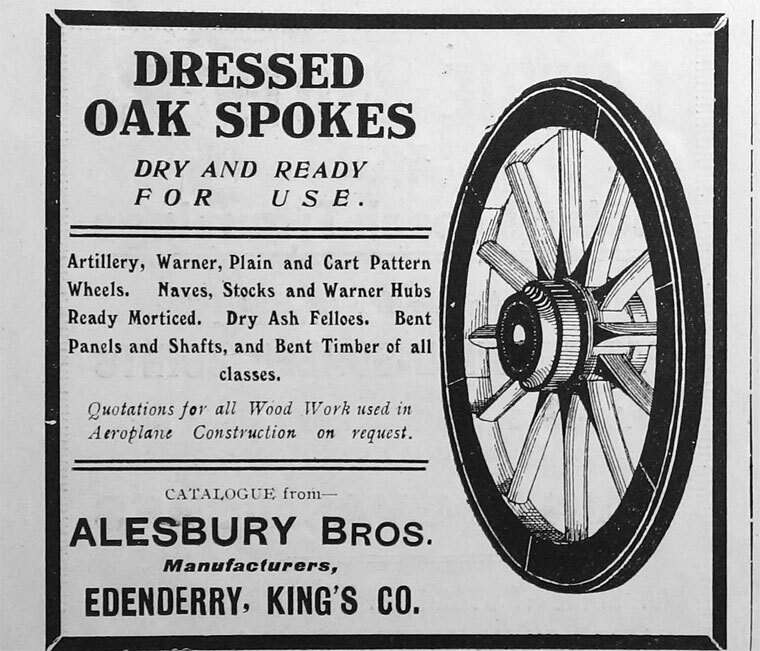 1907 Dublin Motor Show - Exhibited specimens of wheel, and bent timber work for coach and wagon building and artillery motor wheels. "The engine that once ran the Alesbury factory survives to this day in the possession of one Kevin Foley from Newtown Forbes in Co. Longford. Foley regularly exhibits it at vintage shows all over the country. 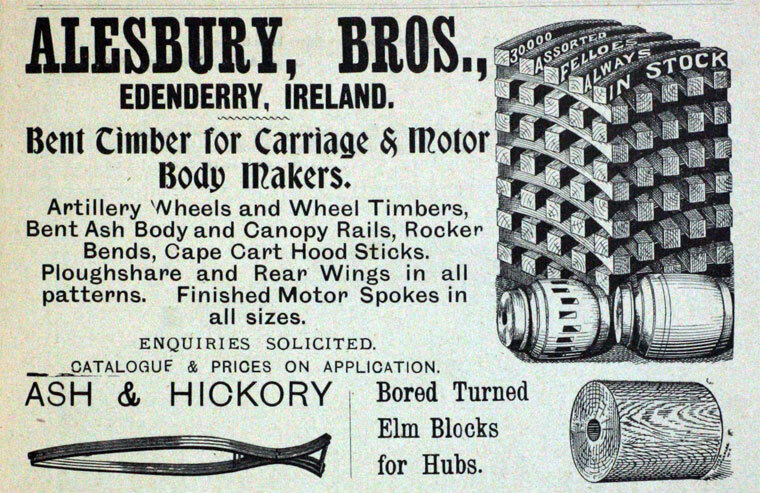 The engine is a rare piece of history in Ireland, and keeps a connection with Edenderry and its former booming industry tradition alive in 2016." This page was last edited on 9 February 2018, at 12:06.